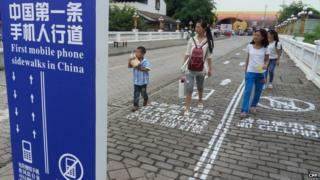 Image caption The lane dedicated to mobile phones tells pedestrians: "Walk in this lane at your own risk." No need to look up! A popular tourist destination in Chongqing, a major city in southwest China, has devoted a portion of its pavement for mobile phone users too entranced by the activity on their screens to avoid other pedestrians. Another section of the pavement jokingly bans phone users. In July, National Geographic commissioned a similar stretch of pavement in Washington DC, in a brief experiment testing human behaviour. This project was initiated by Meixin, the private company that manages "Foreigners Street", the privately-owned theme park. The pavement concept is a tongue-in-cheek attempt to encourage people to think how much time they spend staring at their phones. Photos of the sidewalk attracted ridicule on Weibo, China's version of Twitter. "Am I supposed to jump to the other side of the path when I get an incoming phone call?" one user questioned. "Maybe they can even build one traffic lane especially for drunk drivers in the future," sniffed another. Indeed, the ploy seems to have created a new problem: street congestion, as hordes of people stop in their tracks to snap photos of the special pavement. Correction 17 September 2014: This post has been amended to make clear that the pavement project was a private company's initiative.